« Ohhh my… He is NOT sinking! 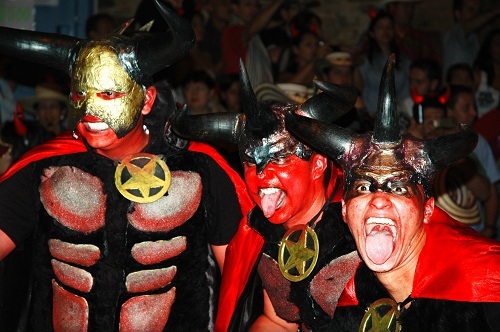 I wonder what madness drove the good citizens of an otherwise normal small town of deeply catholic Colombia to decide to spend one week every two years celebrating the devil. That is so strange that it just has to be witnessed and it is truly an experience. 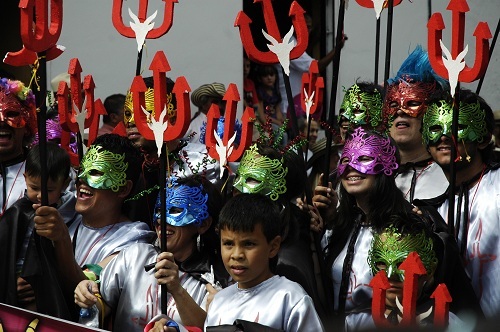 The carnival is celebrated every odd years starting on January 6th and lasts for 6 days. It is quite an incredible show in the streets of Riosucio. The small town center is packed to the brim with people in a festive mood. Little devils are literarily running around everywhere. People are dancing, drinking and enjoying themselves. 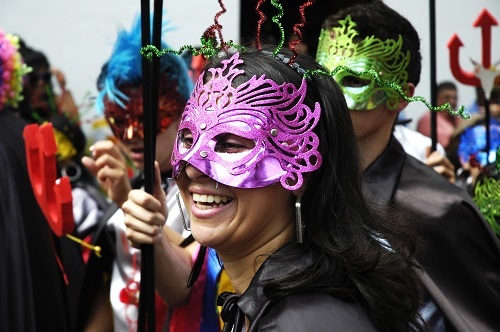 Every day there are parades in the streets with costumes that are colorful and incredible imaginative. 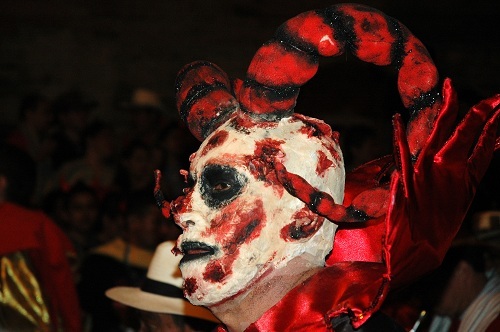 On day two you will see the arrival of his majesty the devil show up as a gigantic figure that is placed in one of the main squares for the length of the festival. He is to be burned on the last day. 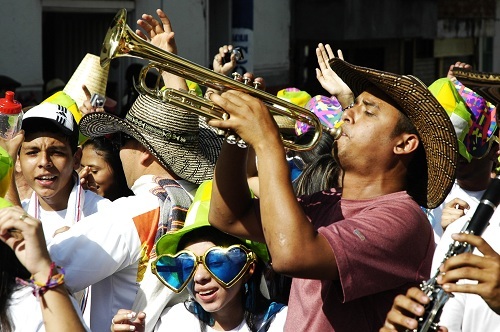 Riosucio is the name of the small town of about 50 000 inhabitants where the festival is celebrated. The name actually translates to Dirty River. Not very charming, but don’t let that scare you away. The town is more inviting than its name. It is situated in the picturesque heart of the coffee region of Colombia, about 4 hours from Medellin and 2 hours from Manizales. Surrounded by the Andes Mountains Riosucio were originally two towns living side by side in bitter rivalry. They were sworn enemies and divided by a wall. In 1819 the two parish priests manages to unite the two towns giving Riosucio the unique feature of two main squares just a block from each other. 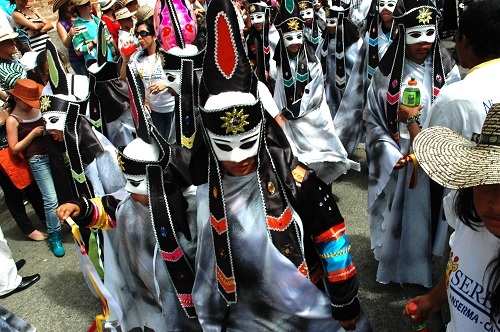 The first celebration of a carnival was by the natives in 1847 and was a celebration of the unity of the two former rivals. In 1915 the festival adopted the devil as the effigy (undesired person or sprit) of the festival. So if you have an inclination of devil worshiping and show up with your stash you have truly missed the point. This entry was posted on January 17, 2011, 16:09 and is filed under Colombia, Photos, Riosucio, Tips. You can follow any responses to this entry through RSS 2.0. You can leave a response, or trackback from your own site. Takker for gode tips! Vi skal absolutt ta for oss Cartagena og gi lyd (eller tekst..) når vi kommer så langt. Vi er vel på plass der i slutten av mars en gang. Du får ha god tur videre, hvor enn du skal!